Ed Sheeran has announced a second leg to his North American tour, kicking off at BBVA Compass Stadium in Houston, TX, on September 3. The month-long trek includes some of the GRAMMY-nominated singer-songwriter’s biggest headlining shows in North America to date. Sheeran’s summer tour is already proving to be a phenomenal success with most dates selling out in a matter of minutes, including Brooklyn’s Barclays Center, Newark’s Prudential Center, and back-to-back nights at the iconic Hollywood Bowl. 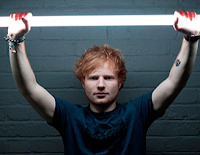 The North American dates – which also include top billing at the New Orleans Jazz & Heritage Festival, Beale Street Music Festival in Memphis, Rock in Rio USA in Las Vegas, and Summerfest in Milwaukee - are part of Sheeran’s highly successful worldwide tour which culminates with three sold out nights at London’s Wembley Stadium.